The Swarovski 81873 BeCharmed Pavé Flag "Japan" flag is an object lesson in stunning simplicity, with a red dot symbolizing the sun against a white background representing honesty and purity. Commonly known as Hinomaru ("circle of the sun"), it is an important element in Japanese culture that embodies Japan's nickname: "The Land of the Rising Sun." Each tiny crystal is handset to recreate the flag, and the bead is branded with "Swarovski Crystals" to confirm authenticity. 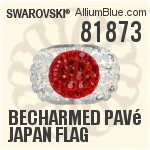 Swarovski 81873 BeCharmed Pavé Japan Flag consist of lead-free ADVANCED CRYSTAL by Swarovski.